The St Vincent de Paul Society of Australia has over 60,000 generous volunteers. They’re in our Vinnies Shops, on our streets, in peoples’ homes, educating our children, lending their ears to listen and provide companionship. They are #VinniesHeroes. During National Volunteer Week (8-14 May 2017) we are pausing to say thank you for all the good our volunteers bring to the world. Our volunteers are everyday people, from all walks of life and backgrounds and together their selfless actions enabled our charity to assist the people in the most need in our communities. By volunteering, you can be sure you’re making a difference for those in need. For some Vinnies volunteers, this is a chance to give something back to the community, to use their skills and experience to make a difference in the lives of people who need assistance the most. For others, it is a chance to develop new skills and experience in a supportive environment. There are more than 5.8 million volunteers across Australia who give happiness to others each year. ‘Give Happy, Live Happy’ is a concept that certainly resonates with experience of Vinnies volunteers. And research says volunteers are happier as a result, with volunteering one of the strongest predictors we have of increasing our health and happiness. 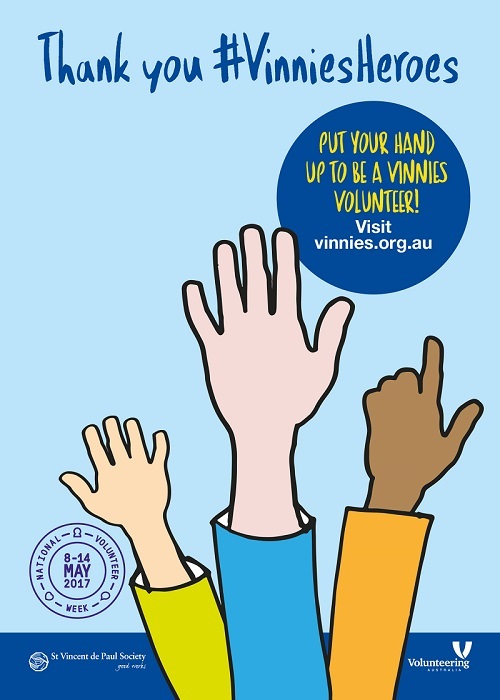 Volunteer at Vinnies to make a difference in the lives of people who need assistance the most. Volunteering is a rich and rewarding experience at Vinnies. Read more about our FAQs for volunteers.